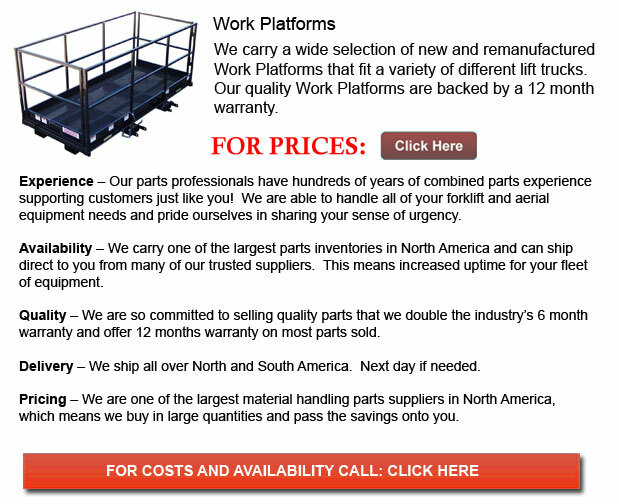 Work Platforms - Forklift platforms provide much more versatility for individuals who work off of a lift truck. These platforms are handy machines since they offer a high level of safety for employees on top of them as well for the individuals below. Forklift platforms are an inexpensive solution for businesses as they are a lot more cost effective than obtaining specialized machinery. These platforms are also desirable as they can save plenty of storage space. To make the most of the advantage and full potential of this machine, you will need to find the platform that best suits the work projects you have in mind. Platforms which slip onto forklift forks are simple to set up and lock into position. Slip-on style lift attachments have become more popular because they are easy and quick to work. They offer an inexpensive solution for businesses that do not need them regularly. These platforms have a railing system in place, tie offs and skid proof decking accessible. They still require the use of safety equipment by employees but come with these certain features so as to further the safety of people who will be using them. Slip-on work platforms are the perfect option for those projects which take place in difficult spaces or over top of an object. A pin system secures this particular sort of platform onto your forklift after sliding the platform on. The industrial lift table provides extra protection because they are outfitted with railings on three sides and a safety screen in the rear. For additional safety, it is a better idea to consider choosing a kind which opens through the front railing instead of the side gate unit. Stock pickers can mount onto a lift truck utilizing the same mechanisms as other platforms but are a lot different. Stock pickers often have a much smaller base surrounding by a front protector screen and railings on three sides. This particular unit differs from the various platforms for the reason that the surface and the cage do not take up the entire fork surface area. Combination platforms prove extremely handy when employees need a large amount of materials so as to complete a project planned at a tall height. This style of table has a superior base section and a security partition around a smaller section. This design is essential so that employees can finish their job and not have to worry themselves about any materials sliding onto them if the person operating it tips or tilts the things. There are a lot of accessories obtainable that could attach to your platform to be able to improve its performance even more. For larger supply items like for instance piping, tall racks outfitted with their own guardrails are an exceptional option. These racks keep materials like for example brooms, pipes as well as various items from falling off of the platform and hitting other workers. For extra proficiency, there are tools, toolboxes and trays designed to fasten directly onto the side of the guardrails.